While the idea of root canal treatment can be a bit scary, this procedure can help a person’s smile by providing welcome relief from toothache pain and saving their tooth. Why try to save the tooth? Keeping the natural tooth in place offers many advantages; it preserves a natural appearance, maintains the sensation and force of the normal bite, and protects the surrounding teeth from strain. The crown of a tooth is the part visible in the mouth. The root of a tooth extends below the gum line. Embedded in bone, it holds the tooth in place in the mouth. The enamel is the exterior surface of the tooth. Mostly composed of calcium phosphate, it is the hardest, most mineralized tissue in the human body. The dentin, a layer of living cells, is beneath the enamel. The pulp is hidden inside the tooth. This soft internal structure is full of blood vessels and nerves. When the pulp inside a tooth becomes infected or inflamed, a root canal may be necessary to save the tooth. Many things can set the stage for an infection of the pulp. Whether it leaves a visible chip, crack or break or not, a traumatic injury to a tooth can allow infection to set in. Faulty crowns and deep cavities are other common culprits. Sadly, repeated dental procedures can also weaken the tooth’s natural defenses and leave its pulp vulnerable to infection. If circumstances warrant a root canal, but the procedure is not performed, the consequences for the tooth can be dire. Untreated pulp infections cause pain and swelling and can trigger the formation of an abscess. Eventually, the removal of the tooth may be required. 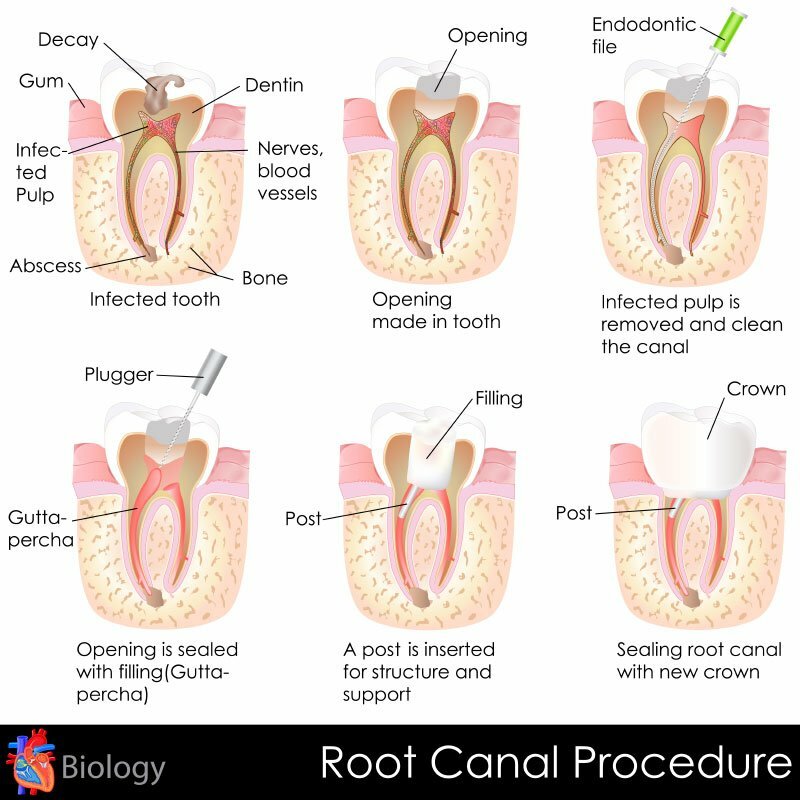 A root canal can be performed by either a dentist or an endodontist, a dentist who specializes in caring for the insides of teeth. During the procedure, the inflamed or infected pulp is removed. Next, the area inside the tooth that was impacted by the infection is cleaned and disinfected. After this space is filled and sealed, the tooth is restored with a filling or crown. Removing all or part of the pulp during a root canal does not kill a fully developed tooth. The surrounding tissues provide sufficient nourishment to keep it viable. In fact, the restored tooth should function normally once the work is completed. Despite their somewhat unnerving reputation, root canals are actually fairly simple procedures that can generally be done with minimal discomfort. With proper dental care, the restored tooth should continue to serve the patient well.